By this time next week, Thursday night at the earliest and Saturday afternoon at the very latest, Jordan Matthews will have a job lined up. Fitz Lassing already has one. 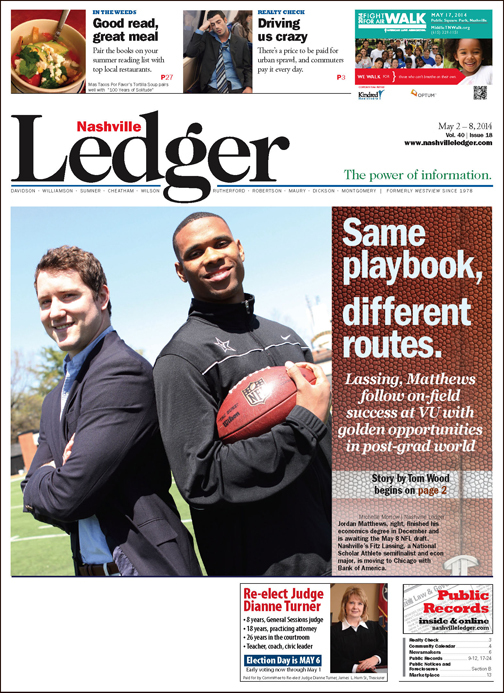 Two Vanderbilt graduates with economic majors, football teammates, young men with shared goals, faith and values, they are preparing to leave the relatively sheltered campus life on West End and head for the fast lane. They’re just taking different paths. Jordan, a star wide receiver, is one of 30 players invited to New York for the NFL Draft, an indication he could be selected in the first round of pro football’s annual talent search. That first round is on Thursday night, but many of the mock drafts suggest Matthews won’t be selected until Friday in the second or third rounds. Wherever he lands in whatever round, he will soon be one of the latest members of the NFL’s Instant Millionaires Club. “My view of the game has never been an outlet to make sure I am financially stable,” says Matthews, the most prolific pass-catcher in SEC football history. “It’s always been something I like to do for fun. 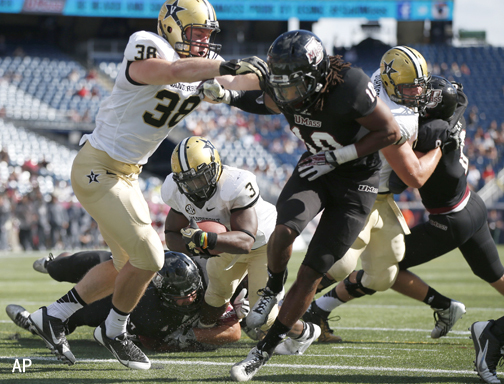 Lassing, an oft-injured Commodores fullback and Montgomery Bell Academy product, will leave Nashville sometime in July for a month of training, then move to Chicago for a position with Bank of America. “The first time I went up there [to Chicago] was in February, and then I actually went to Tampa to interview,” says Lassing, whose given name is John. Culture shock is a term both will likely have to come to grips with over the next few months. One had enough athletic talent to take his game to the next level – Matthews finished his elite career as the SEC’s all-time leader with 262 career receptions and 3,759 receiving yards while hauling in 24 touchdown catches. Lassing had a career total of 12 catches for 101 yards and three TDs. Following their senior season, Matthews earned first-team All-America honors from USA Today and Athlon, and was a consensus All-SEC first-team wide receiver. Lassing was selected to the SEC Academic Honor Roll, was Vandy’s nominee for SEC Scholar Athlete of the Year and was a National Scholar Athlete Semifinalist. Both are quick to credit their families for helping them achieve success, developing traits that have served them well. Matthews grew up in Madison, Ala., and starred at Madison Academy before heading to Vandy. His father, Roderick, is a contracts division manager at Army Contracting Command-Redstone Arsenal, Ala., and mom Brenda Matthews is a systems engineer. Both are Jackson State graduates. Brother Justin Matthews recently graduated from Mississippi State with a mechanical engineering degree. Similarly, Lassing says father, Chuck, a bank officer, and mother, Cindy, taught him the behavior patterns that have benefitted his growth. “My parents are probably the biggest influence from a very early age. Most of what they did was lead by example, just seeing how they acted,” says Lassing, whose father, grandfather and four other relatives attended Vanderbilt. Aside from playing on the same offensive unit and sharing the same major, Lassing and Matthews each credit their families with demonstrating the work ethic required to reach their level of athletic and academic success. Q and A: The former teammates talked with veteran sports writer Tom Wood in separate interviews, but answering similar questions, for Nashville Ledger. Q: Jordan, what are your thoughts as you prepare for the NFL Draft (May 8-10)? That’s got to be pretty heady stuff, keeping your perspective in balance. Q: What’s next for Fitz Lassing, now that your college career is over? Your bio says that you’re working on a degree in biological sciences and medicine, health and society, but what do you plan to do with that? Q: Jordan, you also majored in economics. How will that degree help you in the NFL, understanding the economic side as well as the physical side? At what point did you decide on this course that your life would take? Matthews: “Of course it helps to understand the financial side; knowing it gives me a little edge when it comes to my contract and stuff like that. “Not only will my agent be working on my behalf, but I’ll be able to speak for myself, too, when it comes to how much money I’ll be bringing in. But also, going to Vanderbilt, having to balance football while studying economics, it gives me an advantage. I’m prepared. I know how to manage my time. I’m very good at time management, prioritizing, because I had to balance econ and school with football. Q: Fitz, since Jordan is also an economics major, what advice would you have for him? Lassing: “Well, having gone through the interview process just now, really, you hear all the time about the value of a Vanderbilt degree, what it’ll get you after college. It really became concrete for me, going through this interview and seeing how well-respected it is … Talking to a lot of my high school friends who went to a lot of different places, the SEC, the state schools, the Tennessees, the Alabamas, the Auburns … and I just kind of listened to their stories and realized how many doors the Vanderbilt degree opens for you. Fitz Lassing (38) blocks for running back Jerron Seymour during Vanderbilt’s 24-7 win against Massachusetts last year at Gillette Stadium in Foxboro. Q: So many players leave that economic side of the career to their agents. How active a role do you plan to take in managing the direction of your career, as far as selecting endorsement deals and such? Matthews: “I definitely want to let my agents do their job, because Bus (agent Bus Cook) has been in this business for a long time. I guarantee he knows a lot more than I do. “But at the same time, whenever they have a contract or something, they’ll bring it to me, and I’ll always make sure I look over it, because I know how to read contracts. Q: Fitz, you’ve clearly reached a point in your life where you’re ready to move on. Do you regret not having football? Will you try to stay around it? Lassing: “I still love the game of football, and you know I’ll be watching, hopefully, every Vandy game this coming season. Kind of at the end, after battling injuries and some things, I just realized it was time. I was very happy with my career here; obviously, I love the game of football, but I got to the point where I was going to make a decision. Q: Jordan, how have you prepared for this next phase of your life, both on and off the field? Fitz has a really nice job lined up. He got a job before you! Q: And he’ll have a longer career. Q: Talk about Fitz and your relationship with him. You both arrived at the same time, got on the field as [Vandy] freshmen. Talk about the legacy your class helped establish. Matthews: “Fitz has always been a great person from the very beginning. From the first time I met him, Fitz has always been that guy that, since he lives in the Nashville area, has always invited guys to his house to eat. His family is extremely nice. They’ve been very generous, very hospitable to those of us who have ever gone over there and spent time with them. “But the thing that impressed me, the guy, he’s just a genius. A lot of people don’t see the hard work he puts in when nobody’s looking … when he’s studying, when he’s taking notes every day in class. They’re not looking, but I majored in economics, so I see the type of time he puts in his craft. 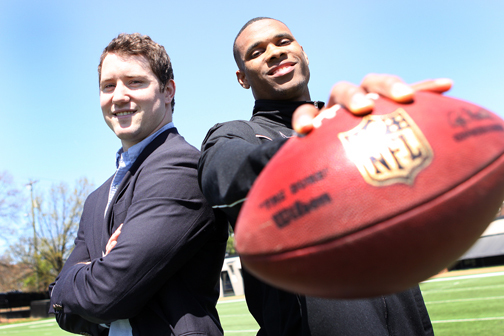 Q: Fitz, tell us about Jordan Matthews and your relationship with him. Both arrived at the same time, got on field as freshmen. The first time you saw him, did you say, man, this guy’s going to be in the NFL someday? 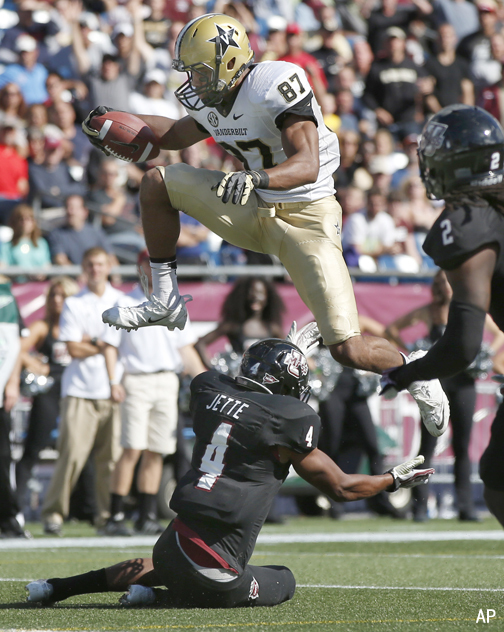 Jordan Matthews (87) is the SEC’s all-time career leader with 262 receptions and 3,759 yards. He is tied for 14th all-time in touchdown receptions with 24. Lassing: “His drive and work ethic from Day One have been incredible. He’s the guy that everybody looks up to, the first one in there. You come over at 6 in the morning and think you’re coming in early to get film, and he’s in the weight room catching tennis balls. That’s insane. The guy never stops. And he’s in the film room all day, doing everything he can to get better. “It’s impressive just watching him. I think he took the whole team to another level. You see the results for him and realize that’s what it takes to be successful at this level. Everybody’s doing 50 reps, and you’ve got to do that much more. “Coming out of high school, you’re big man on campus. Then you get here and everybody’s bigger, faster, stronger. But even as a freshman, you saw Jordan out there every day [trying] to improve in all those areas. You see stuff like that and it’s hard to imagine the guy not being successful at whatever he wants to do. Q: Jordan, have you yet thought about life after football? Staying in the game as a coach maybe, or a manager? Or start your own business? Q: You’re very confident in your abilities. I read one quote that you think you’re the best player in the draft. Where did that character develop, the strength to take on so much? You’ve got a heavy plate. Matthews: “You talk to most guys, most wide receivers, and they’re all going to be very confident. I’m pretty sure every guy in the draft says they’re the best. So you’ve got to have that mind-set if you want to compete on a level like this. “But at the same time, I just know the type of competition I’ve faced in four years here, the way I train, the way I compete. And because of the kind of teammates I’ve had, I just feel like that puts me at the top of the draft. So might as well get used to it and continue to work hard and be humble, and that whenever you are at the top, or close, that people are coming to get you. So I just want to stay humble”. Q: I also read that your favorite quote is from Kanye West, “Everything I’m not, made me what I am.” How does that apply to you? What are you not? Matthews: “It’s just certain ways that I go about my work habits. When I first got to Vanderbilt, guys thought I was kinda weird, that I was kinda different. “But I’ve always felt like the guy, that if you were different, you were unique, that sometimes they called you crazy with their work habits, those are the people who end up being great. As a fullback, Lassing’s role at Vanderbilt was primarily that of a blocker. The former MBA star had 12 career pass receptions for 101 yards and two rushes for 28 yards. Q: Why are you so driven? Is that a byproduct of growing up in a strong family? What was it that initially brought you to Vanderbilt? Matthews: “My work ethic definitely came from the family I was raised in. That just kind of manifested in me [for] a long time, and now it’s helped me become the person I am. “My work habits are just who I am. A lot of people call it working hard, but this is just what I do. “I can’t go to sleep at night if I don’t make sure I catch 200 balls and make sure I go get a workout. Or make sure I go in and watch some film. I won’t be able to sleep tonight if I don’t make sure that I clocked in and got better in some area of my life. So it’s just a part of me, who I am. “It definitely came from my parents, the way I was raised. My parents are hard-working individuals. They graduated from Jackson State University and reached the top of their fields in Alabama. My brother just graduated from Mississippi State with a mechanical engineering degree. Lassing: “My parents are probably the biggest influence from a very early age. Most of what they did was lead by example, just seeing how they acted. You’re a kid, you make mistakes; they just set you on the right track, what was right and what was wrong. They always said ‘don’t lie’. Q: What was it that initially brought you to Vanderbilt? Q: Which is tougher at Vanderbilt, athletics or academics? Lassing: “They’re very different. I think probably the toughest part was trying to balance the two. You know, they’re both obviously difficult in their different ways. Just having a really full plate all the time, especially in-season, because they’re not letting up academically. You have the demands of big-time SEC football, but you still have the papers, tests and exams. Matthews: “For me, I’d definitely say academics, because I love the game too much. It’s not tough, it’s not hard if you love it. It can be a little challenging at times, but you love it and you always have fun with it. But school was definitely challenging. The workloads that you’re given. 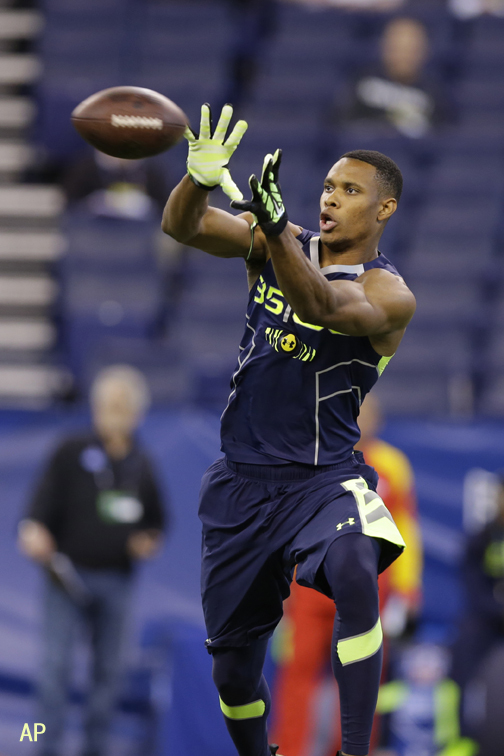 Vanderbilt wide receiver Jordan Matthews makes a catch during a drill at the NFL football scouting combine earlier this year in in Indianapolis. “Sometimes, we’ll have stuff due the first day of class. Some classes I’ve been to. So it’s very definitely a serious workload, but it’s something that if you can make it, it is very satisfying. Q: What drives you, both on and off the field? Q: You’ve been an academic all-star since high school, probably all your life. Did you know that would be where your success at Vanderbilt would lie? Q: Jordan, you’ve enjoyed both academic and athletic success since high school. Did you imagine you’d be where you’re at today, a potential first-round NFL Draft choice? Matthews: “Like I said, I’m so one-day oriented. I never came to Vanderbilt and was like, ‘one of my goals is to go to the NFL.’ It was more of a dream than an actual goal. “My goal was to each day get better than everybody else here. “My goal each day was to beat everybody here out of bed, beat them in workouts, be the last one to leave, beat them to bed so I could get to sleep so I could do it all over again the next day. That was my goal. “I didn’t even want people to say the word, ‘NFL,’ to me my whole junior year when people were whispering about it. I was like, ‘Don’t talk to me about it, don’t talk to me about it. I never liked to talk about it. “The most I’ve said about the NFL has been since I graduated because it’s now the one thing that I’m training for. Q: Failure, or fear of, can be a strong motivator. How has that – or some other challenge – helped in the development of your success? Matthews: “You only fear one thing — and that’s God, because He rules your life. “That’s why I’m not afraid of going to play in the NFL. It’s why I am not afraid of the next chapter of my life, because if God is on your side, nothing can be against you. And then, at the same time, too, worshiping a God like that helps you realize that … it helps you put everything in perspective. Lassing: “Coming here, I never so much feared failure as I saw the opportunities that were there. I saw the potential in the Vandy degree, and that was motivating, just knowing that if I did the best I could do here, anything I wanted to do next, every door would be open. I could have any opportunities. So that was motivating. “Then with football, you know, we had this huge opportunity because coming in as freshmen, we were 2-10, probably the worst team in the SEC. The opportunity to turn that around and make this program – about as good a stretch as we’ve had in recent history – that was motivating. Q: So now you’re going to Chicago. They’re a sort of Nashville North as far as [players for the] Bears are concerned. Players like Jay Cutler, Earl Bennett, Hunter Hillenmeyer have all had success there. Are you going to be a Bears fan? Are you a Titans fan? Lassing: “Well, I grew up being a Titans fan; now being in Chicago with all the Bears fans and all the Vanderbilt guys there, I guess I should …. If Jordan or any other Vanderbilt players land there, I will definitely be a huge Chicago fan. If they join the Titans, I’ll be a Titans fan. Q: What’s the quirkiest thing you’ve ever done? Lassing: “That’s interesting (laughs). I guess a funny story was as a freshman, Eric Bridges was my roommate and … for no rhyme or reason, I guess, we had a big hall meeting, and we told everyone we were members of an air guitar band. And we called it Sasquatch’s Sister. Q: What are your interests off the field? What do you like to do? Lassing: “Now I’ve really started … I haven’t had much time the last three and a-half years, so this is the first time I’ve really been able to figure those things out. Athletics have played such a huge part of my life the last 20 years, it’s hard to factor that. I’ve still been playing a lot … pickup basketball, go to the gym some, working out, things like that. “It’s just a very different mentality now, doing that on your own versus training for college high-level football. But I still enjoy doing stuff like that. And then I just spend a lot of time hanging out with these guys, because in about a month, everyone’s just going to scatter. Matthews: “To be honest, I don’t have too many. Because even when I’m off the field, I like to watch film a lot. So I like to pull up old NFL game films, to watch certain players I like. A lot of people look at that as, ‘oh, you’re still working,’ but it’s just fun to me. So that’s what I do. It’s just one of my hobbies. Q: Do you have a favorite player that you kind of pattern yourself after? Matthews: “Jerry Rice. He’s my favorite. … Yes, he’s my cousin. I feel like we’ll definitely get closer. We’ve talked a few times, and each time that we’ve talked, I feel like I’ve been able to take away some knowledge from him and apply that to my game and the way I look at the next level. Q: Is there anything that Jerry might have said that sticks out for you? Q: If there was a book written, or movie made about your life so far, what would the title be, and why? “I’ve just always tried to be the best in everything I do, whether that’s from high school in my sophomore year, I wasn’t starting in football, that frustrated me to coming here and being the best I could be. “Also, the academics, it’s always been a matter of pride for me. If I’m going to do something, I’m going to try to do the best I can at it. Competitive edge plays a huge part in that. I want to be the best at anything, whether it’s on the field or in the classroom. Q: Is there anything about your four years at Vanderbilt that you would like to change or do differently? Lassing: “I don’t think so. I had a great time here, a great experience. I loved every second of it, on and off the field. “The football experience was an awesome one, and I made some incredible friends. I managed to do some pretty good work off the field in the classroom, and I loved that, too.